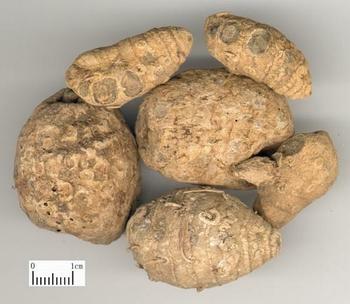 The dry rhizome of perennial herbaceous plant Curcuma phaeocaulis Val. or C. kwangsiensis S. G. Lee et C. F. Liang or C. wenyujin Y. H. Chen et C. Ling of family Zingiberaceae. Peng E Zhu produced in Sichuan, Guangdong and Guangxi provinces in China. Wen E Zhu (also known as Wen Yu Jin) produced in Wenzhou city, Zhejiang province of China. Gui E Zhu (also known as Guang Xi E Zhu) produced in Guangxi province of China. Collected in winter when leaves withered. Fragrant or lightly fragrant, lightly bitter and pungent. Sliced and unprocessed or processed with vinegar. Pungent, bitter, warm; liver and spleen meridians entered. This herb enters not only blood system but also qi system and can attack and break mass, dissolve blood stasis, move stagnant qi and alleviate pain. It is usually indicated for mass, amenorrhea and stagnant pain of heart and abdomen due to qi stagnation and blood stasis served as a key herb in treating mass. It is reinforced by the combination with San Leng and the action of stasis-breaking and mass-eliminating is enhanced. For amenorrhea and abdominal pain and mass, it is combined with Dang Gui and Xiang Fu in E Zhu San from Shou Shi Bao Yuan. For mass under hypochondria, it is combined with Dan Shen, San Leng, Bie Jia and Chai Hu. For angina pectoris, it is combined with Dan Shen and Chuan Xiong, etc. For lingering stasis with weak body, it is combined with San Leng, Huang Qi and Dang Shen for both reinforing reduction. 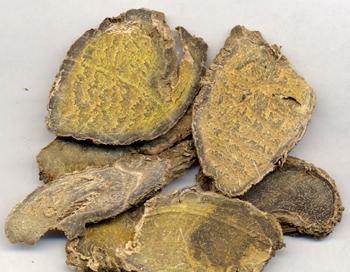 This herb can move stagnant qi, remove food stagnation and alleviate pain indicated for severe distension and pain of epigastrium and abdomen caused by undigested food stagnation. It is usually combined with qi-moving analgesics and digestion-promoting and food stagnation-removing herbs. For instance it is combined with Qing Pi and Bing Lang in E Zhu Wan from Zheng Zhi Zhun Sheng. For food retention due to spleen deficiency and stuffiness, fullness, distension and pain of epigastrium and abdomen, it is combined with qi tonics and spleen-strengthening herbs such as Dang Shen, Fu Ling and Bai Zhu. In addition, it not only breaks blood and dispels stasis but also resolves swelling and alleviates pain. So it is indicated for traumatic injuries, congestion, swelling and pain usually combined with other blood-activating and trauma-curing herbs such as Zi Ran Tong and Su Mu. Decoct 3~15 g. Processed with vinegar for breaking blood and dispelling stasis and unprocessed for moving qi and alleviating pain. Proper dose for external application. This herb is drastic in property with the disadvantage of consuming qi and impairing blood. Do not overtake long. Prohibited for pregnant women and during menstrual periods.